Glacier Peak Wilderness | Keeping Wilderness WILD! You are currently browsing the category archive for the ‘Glacier Peak Wilderness’ category. 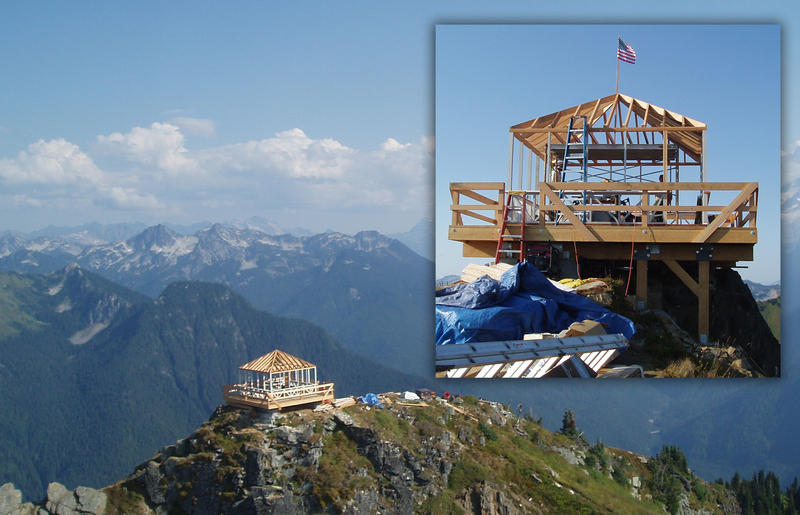 Wilderness Watch recently alerted its members to the U.S. Forest Service’s (FS) newly constructed Green Mountain “Lookout” in the Glacier Peak Wilderness in Washington’s North Cascades (and also mentioned a number of other outlaw projects we’re dealing with). It was built with freight helicopters and power tools along with a healthy dose of arrogance. It’s actually not intended to serve as a lookout: the last time a person manned a lookout in the area was the early 1970s. No, this was built to be a visitor center of sorts, complete with its resident ranger leading nature hikes, and directly contrary to the legal mandate that there be no structures or installations in Wilderness. The agency would have gotten away with this egregious breach of wilderness ethics and law had not a Wilderness Watch member and former wilderness ranger discovered the project on his own. You see, Forest Service officials plotted it in private, avoiding public process or participation, thinking they might sneak their unlawful activities under the radar. While the administrators who approved this structure may view it as a minor intrusion, the pictures alone demonstrate that it is anything but. This is a steel-reinforced human-built structure high atop a mountain ridge deep in Wilderness in clear violation of the letter and spirit of the law. • The original lookout was constructed around 1933. • By the late 1970’s the FS had determined it was no longer serving effectively as a fire detection lookout and it was abandoned. • The Washington Wilderness Act of 1984 expanded the Glacier Peak Wilderness to include Green Mountain. • In 1998, a brief decision memo was signed for use of motorized equipment for repair (reconstruction) of the lookout. With that decision in-hand, the FS used a grant from the White House Millennium Council’s Saving America’s Treasures program to construct a new foundation, catwalk, railings, siding, etc. • In 2002, the whole structure was seriously damaged and was removed from the Wilderness. This was done with a helicopter, but without any public notification or analysis. • In 2009, the new structure was built. Again, no public notice or environmental analysis. It was all done using helicopters to transport materials, and motorized equipment for the construction. It’s obvious from the photos that the materials used in the reconstruction are mostly new (A former ranger describes it as “95% new material including some re-used from the reconstruction ten years earlier.”). What is it about the law’s mandate that there be “no structure or installation” built in Wilderness that the Forest Service doesn’t understand? We don’t intend to let them get away with this. And with your support, we’ll make sure they don’t.